What are the hidden risks in your business and how much are they going to cost you? Have you registered a trade mark for your business with IP Australia? Not registering a trade mark for your valuable brand or product could reduce the value of your business - a business or company name is not sufficient IP protection. Do you have proper terms and conditions and other contracts for your business? If not, you could be leaking profits. Buying or selling a business or franchise? Do you really know the traps for the unwary, which can turn the transaction into a financial and legal nightmare? Do you have properly drafted employment contracts or independent contractors agreements? If not, you should put a lot of money aside for potential workplace claims. Do you really know what will happen to your shares in the company if you die or become totally or permanently disabled? If they end up in the wrong hands it can be disastrous for the business and the remaining shareholders. Do you clearly understand your director's duties in terms of the Corporations Act? Did you know that you could be personally liable for company losses if you breach those duties? Do you have secure tenure of your business premises? In particular are you protected by the Retail Leases Act in Victoria? If you answered "No" to one or more of the above questions, we can help you. Contact us today for a no-obligation discussion. 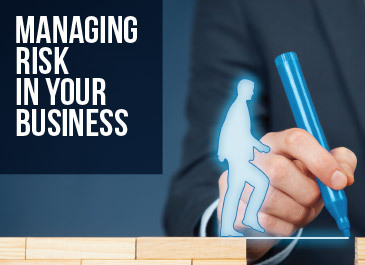 Click the link below to download a pdf copy of our brochure on "Managing Risk in Your Business" so you can print it and go through the questions at your own pace.